SellingRestaurants is offering this well received La Jolla restaurant for sale. Surrounding demographics support local favorites like this in good times and bad. 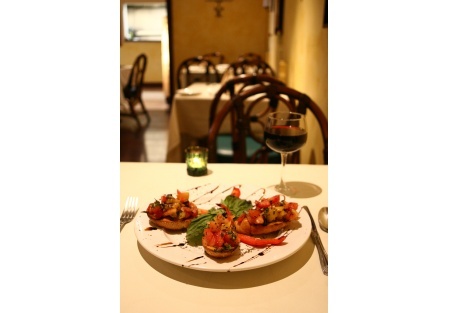 Offering outstanding Italian food for lunch and dinner this charming and well appointed restaurant is ready to go for its next owner. The space has approximately 1800 square feet inside and another 800 square feet of outside dining area. Sales over the past 36 months have ranged from 18k per month to 35k per month, could be a goldmine with the right owner finding a way to consistently keep sales at the high end of the sales range. Rent is $3,600 per month and landlord has expressed interest in negotiating a new lease with lower rent and a longer term. Continue with the current successful concept or bring in our own, this well equipped restaurant is turn key for a dedicated owner operator. Click on one of the orange buttons below to get the address and full listing details. This is a Stone Path Brokerage Services, Inc. DBA Selling Restaurants San Diego listing. Notice: The User (that's you reading this) of this Website understands that STONE PATH BROKERAGE SERVICES CORPORATION ("Broker") or its agent(s) do not audit or verify any above information given to or gathered by Broker or its agent(s) from Seller, our Client, or make any warranties or representations as to its accuracy or completeness of the information provided, nor in any way guarantee future business performance. The User should perform a complete and detailed due diligence on the business and or real estate before buying it. In some cases, foreward looking statements may have been made but these statements are absolutely no guarantees of future performance of the business as each User has differing skills sets to either grow the business or kill the business. Owning a business is a risky venture, but can also be a rewarding one. The User of this website is solely responsible to examine and investigate the Business and or real estate, its assets, liabilities, financial statements, tax returns, and any other facts which might influence the User's purchase decision or the price the User is willing to pay. Any decision by User to purchase the Business shall be based solely on User's own investigation and that of User's legal, tax, and other advisors and not that of Broker or its agent(s). Any listing information may change at any time without any notice to User. DRE License # 01339409. Super Cheap, Near New Restaurant Prime San Diego Area with Low Rent! 5 Day Cafe with LOW RENT! Work Less! Profit More! Healthy Food Biz Franchise Restaurant 50% seller financing! Pizza on The Beach - What Could be Better!